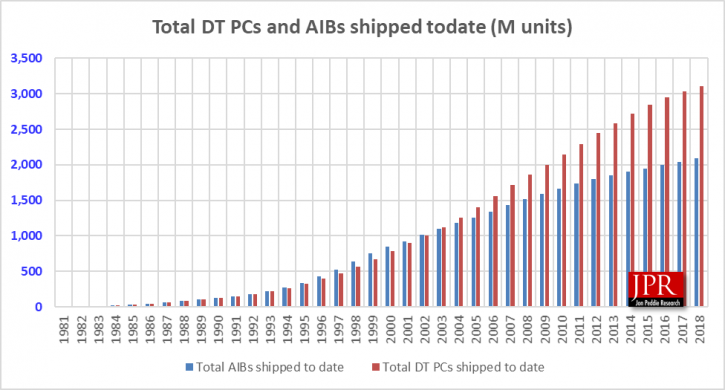 Jon Peddie Research, the market research firm for the computer graphics industry, has released its quarterly Add-in Board report on world-wide AIB shipments used in desktop PCs for Q3'18. The add-in board market decreased in Q3'18 from last quarter while Nvidia gained market share. Over $2.5 billion dollars of AIBs shipped in the quarter. Quarter-to-quarter graphics board shipments decreased by 19.2% and decreased by 36.1% year-to-year. The market shares for the desktop discrete GPU suppliers shifted in the quarter, Nvidia increased market share from last quarter, it also increased share from the same quarter last year. Since 1981, 2,083 million AIBs have been shipped. Add-in boards (AIBs) using discrete GPUs are found in desktop PCs, workstations, servers, rendering and mining farms, and other devices such as scientific instruments. They are sold directly to customers as aftermarket products or are factory installed by OEMs. In all cases, AIBs represent the higher end of the graphics industry with their discrete chips and private, often large, high-speed memory, as compared to the integrated GPUs in CPUs that share slower system memory. In addition to privately branded AIBs offered worldwide, about a dozen PC suppliers offer AIBs as part of a system, and/or as an option, and some that offer AIBs as separate aftermarket products. We have been tracking AIB shipments quarterly since 1987—the volume of those boards peaked in 1999, reaching 114 million units. This quarter 9.9 million shipped. Discrete GPUs are the heart and soul of add-in boards (AIBs) and Jon Peddie Research’s Add-in Board Quarterly Report covers the market activity of PC-based graphics for Q1’18. This detailed 111-page report will provide you with all the data, analysis and insight you need to clearly understand where this technology is today and where it's headed. Jon Peddie Research’s AIB Report is available now in both electronic and hardcopy editions and sells for $2,500. The annual subscription price for JPR’s AIB Report is $5,000 and includes four quarterly issues. Full subscribers to JPR services TechWatch are eligible for a 10% discount. Bundle packages are also available. For information about purchasing the AIB Report, please call 415/435-9368 or visit the Jon Peddie Research website at www.jonpeddie.com. Contact Robert Dow at JPR (Robert@jonpeddie.com) for a free sample of any of our reports. Looking for the annual subscription?